Mr. Diwakar Nigam, Newgen Managing Director and CEO, receives a special plaque from Mr. Don Lofstrom, President and General Manager, Alaris, a Kodak Alaris business. The plaque was presented to recognize Newgen for their partnership and to thank them for visiting the new Kodak Alaris Experience Center in Rochester, NY (USA). 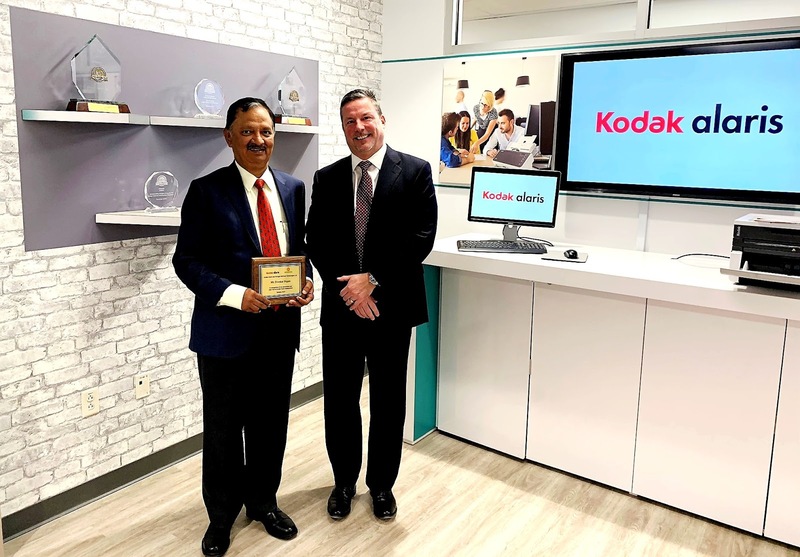 Kodak Alaris and Newgen Software Technologies Limited have announced a new global strategic alliance that will provide their customers and channel partners with access to best-in-class solutions to help organizations drive digital business. Under the agreement, Newgen and Kodak Alaris will expand, connect and grow their network by jointly recruiting partners with similar profiles to help sell their solutions. Kodak Alaris scanners are now included on the Newgen certified document scanner list. The alliance is expected to generate new business opportunities for channel partners that work with Alaris and Newgen across geographies, vertical markets, and applications. It positions Alaris and Newgen as partners of choice for customers around the world looking to leverage the power of their information, reduce cost, save time and optimize business processes. Through its comprehensive scanner portfolio, scalable capture software solutions and expert managed and professional services, Kodak Alaris enables organizations to automate business processes and take complexity out of information capture. Newgen’s solutions extract greater value from enterprise data systems integrating with content repositories across multiple sites to eliminate redundant processes. Newgen leverages new-age technologies such as cloud, robotic process automation (RPA) with business process management (BPM), digital sensing, enterprise mobility and process analytics to help organizations reinvent their workplaces. Alaris has won more Buyers Lab Awards than any other scanner manufacturer, including four Scanner Line of the Year awards. Newgen, on the other hand, has received strong industry recognition from leading analyst firms such as Gartner and Forrester for its robust BPM, ECM (enterprise content management), and CCM (customer communication management) products.